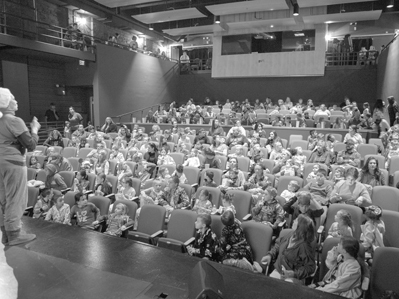 Above, dozens of pajama-clad youngsters listen as Artesia Arts Council executive director Laurie Schotz prepares to begin a screening of “The Polar Express” Tuesday during the Ocotillo Performing Arts Center’s inaugural family Polar Express event. 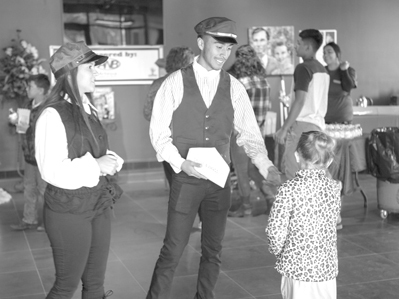 Children received customary golden tickets, being taken below, and a small Christmas gift, and enjoyed hot cocoa and popcorn during the film. Schotz reported an excellent turnout for the free event, such that some people were unfortunately turned away. Approximately 275 were able to enjoy the event, which Schotz says will be held again next year at two separate times. It will remain free, but attendees will be asked to make reservations.